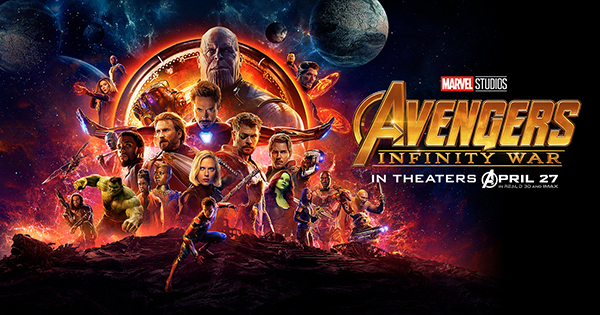 AVENGERS IN ACTION: Preparing for battle, the Avengers and their companions pose for the promotional cover of Marvel’s Avenger’s: Infinity War. Released on April 27, 2018, Infinity War is the third Avengers film in the series and generated $1.607 billion in box office sales. “What Just happened? That did not happen! They can’t do that!” If you are a die-hard Marvel fan like me, I’m sure your reaction was similar to what mine was. After walking out of the theater after the movie, Avengers: Infinity War, my emotions were in shambles as if ground through a blender. First off, Thanos takes the crown for the best Marvel Cinematic Universe villain. Prior to Infinity War, my top three villains were Loki, Ultron, and Erik “Killmonger” Stevens. Thanos blew them all out of the water with his strength, wisdom, insane vision and drive to destroy half the universe. Seeing Thanos’ powers strengthen throughout the movie as he steals, murders and sacrifices for the infinity stones shows the true length that Thanos is willing to go in order to make his vision for the universe a reality. Hats off to you, Marvel! All 18 movies prior to this one, each one building up the hype of Thanos more and more, left me hesitant to see what the actual product would be. I was not disappointed. Although Infinity War will go down as one of my favorite movies ever, there was one thing that left me bummed out: not once in the whole movie did we get to see all of the Avengers suit up and go to war together. While Tony Stark, Peter Parker, Doctor Strange and the Guardians of the Galaxy battled Thanos on his home planet of Titan billions of miles away from Earth, Captain America, King T’Challa and the relatively ineffective Bruce Banner battled Proxima Midnight and Cull Obsidian and their army of Alien beasts in Wakanda. Now, was I that bummed? Not really, because each battle was equal and awesome in its own way. I can’t remember how many times I have said this in the past few weeks, and sorry if I am spoiling the movie, but the battle of Wakanda scene is the GREATEST SCENE IN MARVEL FILM HISTORY. Seeing King T’Challa and Captain America defend Earth valiantly is awesome already, but I was hoping for just a tad more. Marvel delivered, and in a big way. Marvel finally got my favorite superhero right: Thor. As I was watching the Avengers defend Wakanda and seem to be doomed by the numbers of Thanos’ army, in came the single greatest moment I have ever seen on the big screen. Thor making an elaborate entrance with the Bifrost (his way of traveling through the nine realms of the universe) and his new friends Groot and Rocket paired with his newfound burning passion to destroy Thanos was brilliant. Then when I saw my favorite character leap into the sky, harnessing the lighting and thunder from Earth with his new weapon, the Stormbreaker, I was speechless.